Thirty artists were challenged to depict a different mythical creature. This book charts their creative processes. An in-depth, inspirational guide to help you create mythical creature designs of your own. Mythical Beasts: An Artist’s Field Guide to Designing Fantasy Creatures offers an unusual case of teaching by example. But it works brilliantly – so if you're wanting to learn how to draw these animals, look no further. Thirty professional artists, including Sean Andrew Murray, Bobby Rebholz and Kiri Østergaard Leonard, have each been given a different mythical beast to investigate, dissect and design. 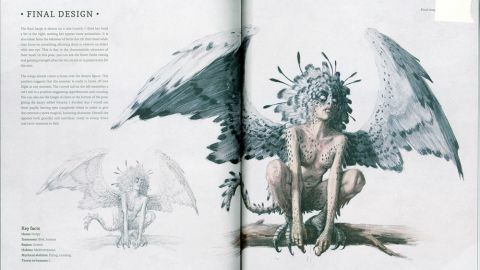 These range from the well-known, such as the yeti, phoenix, unicorn and kraken, to the more obscure, including the leshy, a Slavic woodland spirit; the Jörmungandr, a Norse serpent monster; and the nue, a Japanese creature with the face of a monkey, the body of a racoon dog and the tail of a snake. But this isn’t just a collection of finished work. Crucially, each artist gets eight pages to show and explain their research, concepts and initial sketches, with the final two pages devoted to the completed design, which is coloured. So the effect of perusing this large, hardback, matte-printed book is less like visiting a gallery and more like looking over a number of artists’ shoulders from start to finish. The reason this works so well is that the entries are structured in a rigorous way, making them easy to follow, and compare and contrast with what others have done. So each artist begins with Field Notes, which describe the real-world animals, plants, patterns, textures and anatomy that have informed their mythical designs. Next comes Design Process, where they explain the evolution of their concept, from thumbnails to working on different poses. That’s followed by a Subspecies section, which demonstrates how their basic design can be adjusted and expanded up to develop something related but new. Finally, we see the completed design, accompanied by a black-and-white line drawing that shows how it was constructed. There’s absolutely no ego on show here: everything that’s been included is geared towards helping fellow artists develop their skills. So as you leaf through these well-crafted pages, you shouldn’t fail to find useful tips and inspiration to create mythical creature designs of your own. This article was originally published in issue 157 of ImagineFX, the world's best-selling magazine for digital artists. Buy issue 157 here or subscribe to ImagineFX here.